Turkish Airlines EuroLeague Final Four 2017 will take place this weekend in Istanbul. This season has been particularly demanding for the 24 participating teams, and the championship will culminate with four exciting matches played by highly deserving teams to get the trophy: CSKA Moscow, Real Madrid, Fenerbahçe and Olympiacos Piraeus. The intense final round of this competition returns to Istanbul, the welcoming and attractive metropolis of Turkey, five years after the EuroLeague Final Four 2012. The matches will take place in the famous Sinan Erdem Dome, Turkey’s largest indoor arena and one of the biggest in Europe, where the final round of the 2010 World Basketball Championship was also celebrated. EuroLeague Basketball was created in the 2000/2001 season. In 2010, Turkish Airlines, flying to more countries and international destinations than any other airline in the world, became the official sponsor of the most important basketball competition in Europe, as well as its final round. For this season, the flag company will celebrate the Final Four in Istanbul, in its home, making this collaboration even more special, with a really welcoming audience encouraging all the teams. The global brand has even themed the TC-JRO Airbus A321, livering its exterior with graphic allusions to the EuroLeague, which is flying around the sky over Istanbul. 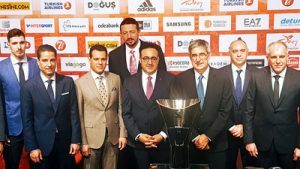 Turkish Airlines sponsorship to the EuroLeague Basketball will continue for three more years.